” كنا ننهى أن نصف بين السواري على عهد رسول الله صلى الله عليه وسلم، ونطرد عنها طردا “. Collected by Ibn Majah 1002, Ibn Khuzaimah 1/, Ibn Hibban 400, Al-Hakim 1/218 al-Bayhaqi 3/104 and Tayyalisi 1073 from the way of Haroon Abi Muslim who said Qatada narrated to us from Muwaweeyah bin Qurra from his father who said: [the narration]. Al-Hakim said: ‘Its Isnaad is Saheeh.’ And Dhahabi agreed with him. Collected by Abu Dawood, Nisa’ee, Tirmidhi, Ibn Hibban and Al-Hakim and other than them with an authentic chain as I explained in ‘Saheeh Abi Dawood’ 677. I [Albaani] say: This hadeeth is a clear text in abandoning of making a row between pillars, and what is obligatory is to move forward or move back. ” لا تصفوا بين السواري “. ” وهذا – والله أعلم – لأن الأسطوانة تحول بينهم وبين وصل الصف “. ” لا بأس بالصفوف بين الأساطين إذا ضاق المسجد “. ‘It is not disliked for the Imam to stand between pillars, but it is disliked for those praying behind the Imam, this is because it breaks the rows. It was disliked by Ibn Mas’ood and Nakha’ai, it has been narrated from Hudayfah and Ibn Abbas. It was given as a concession by Ibn Sireen, Malik, those who followed opinions and bin al-Mundhir, because there is no evidence to prohibit forming rows between pillars. 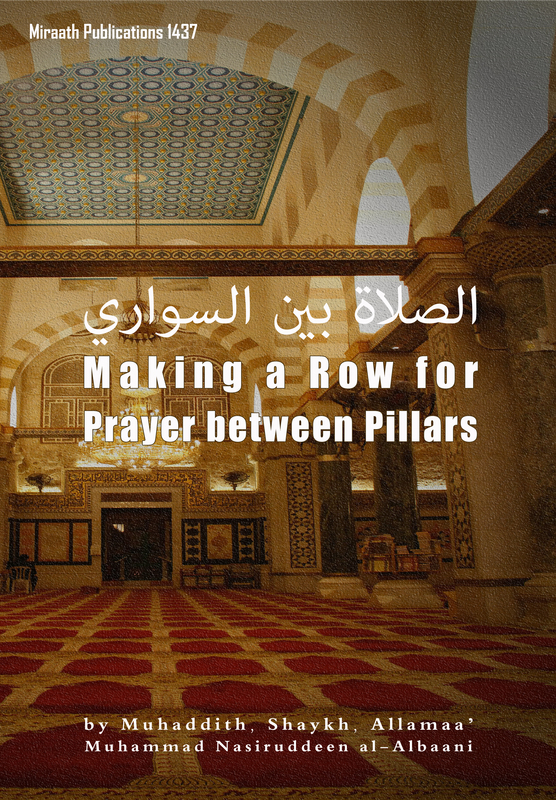 I [Albaani] say: also what takes the ruling of the pillars is a large Mimber (the place from where the Khateeb delivers the Khutbah) which has many steps, since it breaks the first row and also sometimes the second row. and the two ends of the row are disconnected. I [Albaani] say: Indeed a Mimber can disconnect a row if it opposes the Mimber of the Prophet -sallAllaahu alayhi wa sallam- since it had the steps/ levels so the likes of which would not disconnect a row, because the Imam would stand beside the lowest step of the Mimber. So it is from calamities to oppose the Sunnah in how the Mimber should be in what falls into the prohibition which occurs in this hadeeth. Likewise what disconnects the row is placing a heater which is placed in some Masajid, it is placed in a certain way which results in disconnecting a row, without the Imam of the Masjid or anyone from the worshippers in there paying any attention to this prohibition due to the people firstly being far from having an understanding of the Deen and secondly them not having a concern of keeping away from that which Allaah prohibited and disliked. ” … ومن قطع صفا قطعه الله “. T.N. – Mastoor is a term in the science of Hadeeth. It is a form of Majhool (unknown) a term used for unknown narrators. Mastoor is when two or more narrators are mentioned in a chain but they are not trustworthy.